Printed patent application signed by Thomas Edison in autograph, ("Thomas Alva Edison"). 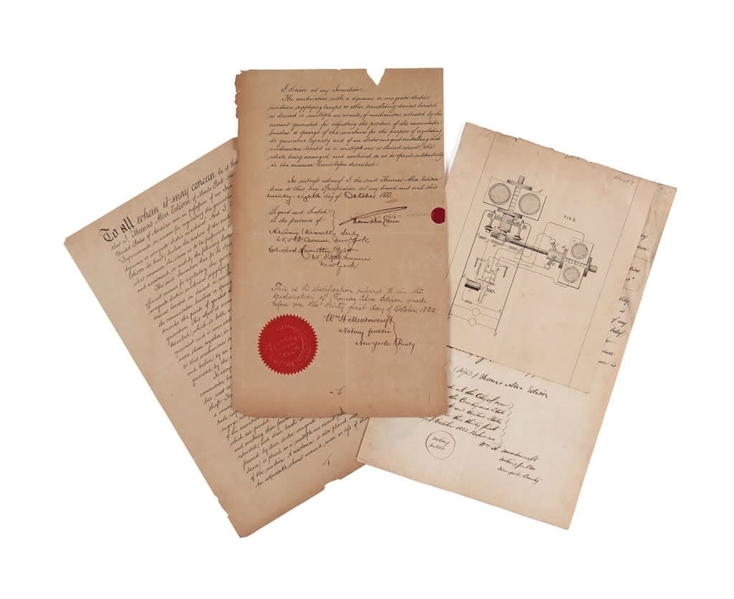 The document is an overseas patent application relating to dynamos for electrical lamps, stating that 'I, Thomas Alva Edison of Menlo Park New Jersey United States of America am in possession of an invention for "Improvements in means for regulating the generative capacity of dynamo or magneto electric machines"', countersigned by William Henry Meadowcroft, signed ("Wm H Meadowcroft"), paper seal, 6 pages ; also included are two printed mechanical diagrams pasted at upper left corner to watermarked paper, one containing printed text with autograph annotations, browned, some chipping to edges, 8 pages in total, folio , 28 October 1882. Edison's Indian and Colonial Electric Company was incorporated in England on 13 June 1882, shortly before this document was signed, in order to promote the Edison system of electric lighting in Australasia, Ceylon, India and South Africa. Meadowcroft was a close friend and secretary of Edison's, as well as co-author of the inventor's biography.